Some off you saw the title of this post and are already calling to have my man card revoked. I refuse to give it up and will fight you if you think this show is girly. This Is Us is the best TV drama that has been on TV in years. If you don't believe me, you're wrong. Some people might say it plays with the viewers emotions. To that I say "play away." It does it in all the best ways. 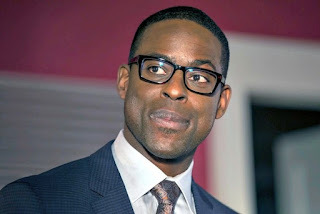 There are lots of things great about This Is Us, but by far the best is Sterling K. Brown, That dude is just so dang likable. I first became aware of this acting giant in The People Vs OJ Simpson. He was great as Christopher Darden. Then when I saw him on This Is Us, I was hooked. I now wish this guy was on every show. He might have even made the movie I watched last night better, if given a chance. Ok, so he's great, but the writing on the show is too. I find myself connected to the different story lines in so many different ways. Of course, I understand some of their daddy issues due to the fact that my father passed away in 2011. So anytime there is father drama, I'm pulled right in. I hope this show continues on for many years and then after that they spin off Sterling's character to his own show called "This Is Me." In the meantime, I completely agree with something I heard Chris Hardwick say on a talk show recently. He really needs to do a "This Is Us" after show called "That Was Them."